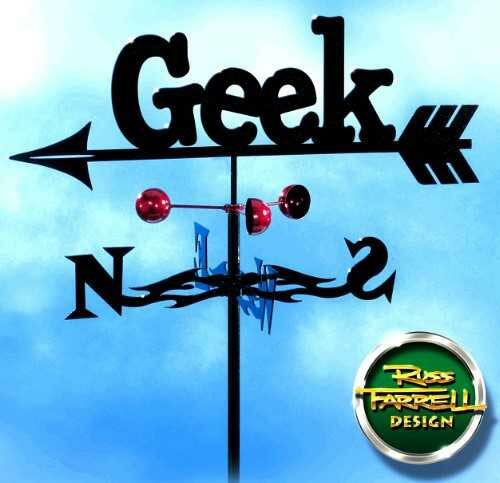 If you want everyone to know your a complete geek, then you need one of these geek weathervane’s to put on your house. Since this is a geek product, lets get technical: The Geek Weathervane is handmade in the USA out of strong 16 gauge steel, covered with copper colored powder coat paint. The top of the weather vane pivots on a strong stainless steel pin and the wind-cups have a sealed ball bearing that will spin with the slightest breeze. It comes with a rod to mount it in your garden or your choice of roof, post, or side mounts. Its also totally awesome. The Geek Weathervane is up for sale on Ebay for $52.95.